Soldiers' Angels - Holiday Support in a BIG Way! Every year during the holiday season, we are blown away by the incredible support we see from our Angel volunteers, supporters, donors, and community partners. This year, we want to shine some light on one Angel volunteer who has gone above and beyond for our service members, wounded heroes, veterans and military families. 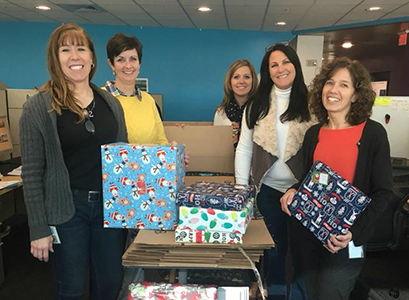 Our latest blog features Angel Barbara and her amazing team of elves, I mean co-workers, at the Military Service Network at Barclaycard. Not only did her team adopt 8 large families (49 kids and 16 adults!!) -- but they also donated stuffed stockings, contributed a monetary donation, and more! Read the full story about this amazing Angel and her team.